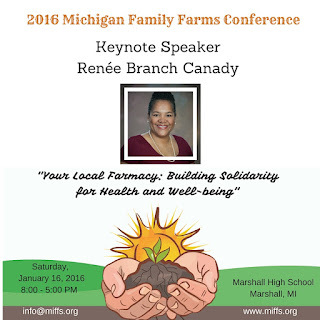 My apologies for cross postings, but we want to ensure you know about the Michigan Family Farm Conference because it's awesome. Please feel free to share this opportunity with your lists, networks & friends! To all the wonderful farmers out there, this is a great opportunity to network with each other while you have some time to learn & connect! And for folks looking to connect with farmers for marketing opportunities or other reasons, come out to Marshall and meet all the great producers who attend this conference! Here's a quick link to the Conference info & registration: http://bitly.com/2016mffc. Do you see your farm as both a place to produce food as well as a place to improve the health and well-being of your entire community? Renée Canady, our 2016 MFFC keynote speaker, views your farm as a local “farmacy” offering critical products for protecting and promoting the public’s well-being! As CEO of Michigan Public Health Institute (MPHI), Renée advocates for innovations that embrace cultural wisdom and a commitment to social justice. MPHI recently launched the Center for Health Equity practice, grounded in organized community efforts and preventative actions. Prior to MPHI, she was the Health Director at Ingham County Health Department and former chair of the Health Equity and Social Justice board for the National Association of City and County Health Officers. Renée is a storyteller and educator who will both engage and energize this year’s conference attendees. Here it is again, a quick link to the Conference info & registration: http://bitly.com/2016mffc. We hope to see you there! Rise up & Dig In!